Tag line: "I was feeling blue, but I'm better now"
One of animator / director Hayao Miyazaki’s most underrated films, 1989’s Kiki’s Delivery Service centers on a teenage witch who strikes out on her own in the hopes of finding her place in the world. 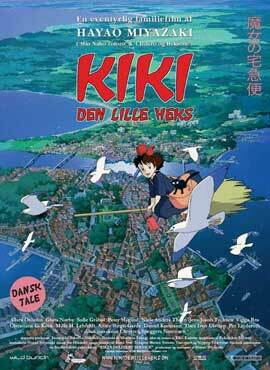 Now that she’s 13 years old, Kiki, a young witch, must leave home and continue her training in the real world. With her talking cat Jiji in tow, an enthusiastic Kiki settles down in a large seaside village and quickly befriends Osomo, a baker’s wife, who lets the eager newcomer move into their upstairs storage room. Before long, Kiki opens up her own delivery service, and with the help of her trusty broom she manages to generate a great deal of business for herself. But when her powers start to fade, Kiki must find a way to get them back, and fast. Should she fail, her dreams of becoming a full-fledged witch may be over before they’ve had a chance to begin. As I mentioned in my write-up of Nausicaa of the Valley of the Wind, Miyazaki’s films are at their best when his characters take to the sky, and Kiki’s Delivery Service features a number of scenes in which its lead hops on her broom and soars through the air. From the moment she starts her trip (when Kiki has some trouble controlling her broom) to the thrilling finale, Miyazaki uses the beauty of flight to build tension and excitement throughout Kiki’s Delivery Service, and does so brilliantly. Yet it’s Kiki herself, with her infectious exuberance for life, who is the heart and soul of this film. A smart, ambitious teenager, Kiki (at the outset, anyway) is always upbeat, a nice contrast to her pessimistic cat Jiji (who, thanks to his mopey attitude and fear of the unknown, gets most of the laughs early on). With her kindly disposition and willingness to work hard, Kiki is an excellent role model for young girls, and along with Nausicaa and Spirited Away’s Chihiro is one of Miyazaki’s most well-defined characterizations. A great movie for parents to share with their daughters, Kiki’s Delivery Service also ranks right up there with Spirited Away, Princess Mononoke, and My Neighbor Totoro as one of Hayao Miyazaki’s finest achievements.